Alvechurch artist George Benson has transformed a dull area of the city. A vibrant creation by Alvechurch artist and designer George Benson is now brightening up a corner of Birmingham as part of a street improvement scheme. George was commissioned to produce a contemporary and dynamic piece of artwork to transform Livery Street Wall, previously a dull concrete structure, following a public art competition. 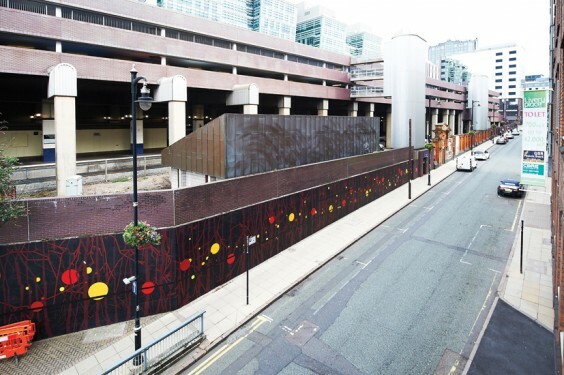 The Livery Street Wall is situated at the entrance to Livery Street by the junction with Great Charles Street and is located by a key entry point to the car park at Snow Hill station. It is also on the route of buses serving the city and for employees walking into the business district from the Jewellery Quarter. The project is one of several improvements organised by the Colmore Business Improvement District (BID) to enhance the city’s commercial quarter, delivered in partnership with Network Rail and Highcross. George has exhibited in London and New York and has worked as a designer for more than 15 years for clients including The New Art Gallery Walsall and Birmingham Opera Company. He says: “It was an amazing opportunity to have the chance to create something beautiful for Birmingham’s street scene, something that has long term impact and isn’t just a temporary installation. Colmore BID board director Sarah Skurr says, “We are delighted with George’s work, which has transformed Livery Street Wall to create a fresh and vibrant access point to the city’s business district.